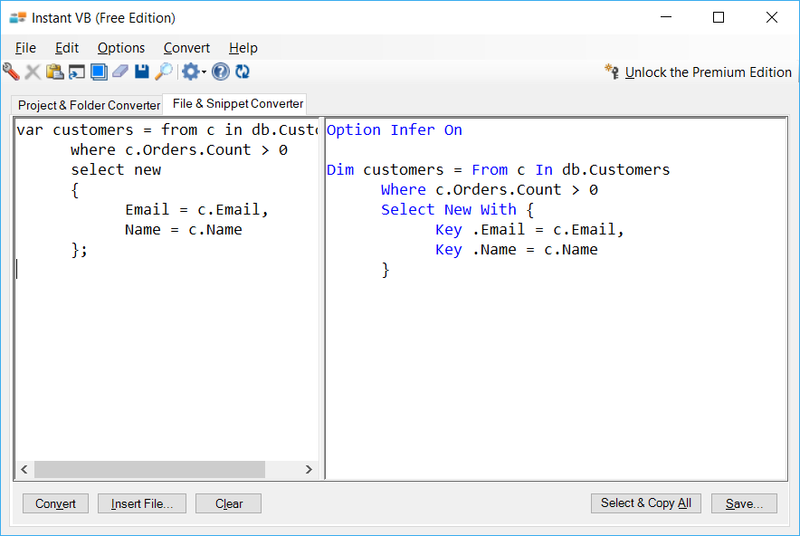 Instant VB produces great VB.NET code, saving you hours of painstaking work and valuable time. 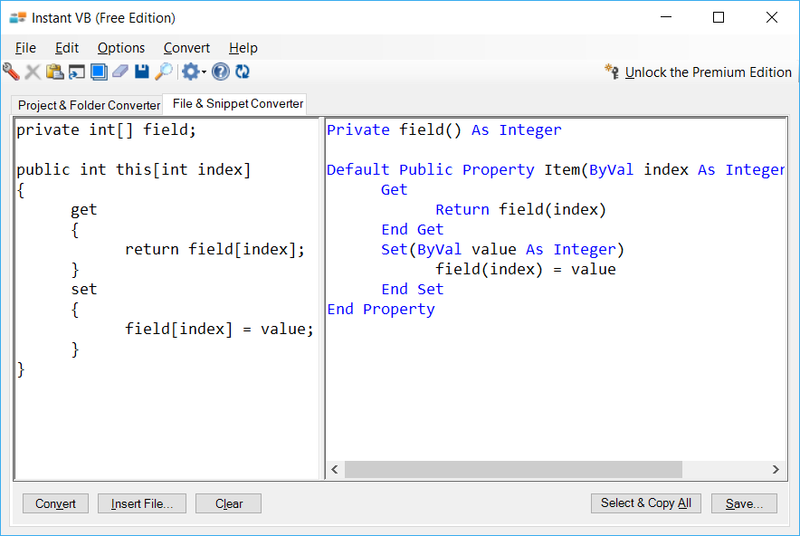 There are other C# to VB.NET converters – use the one that's right for you. *Scroll right to see Instant VB in action! 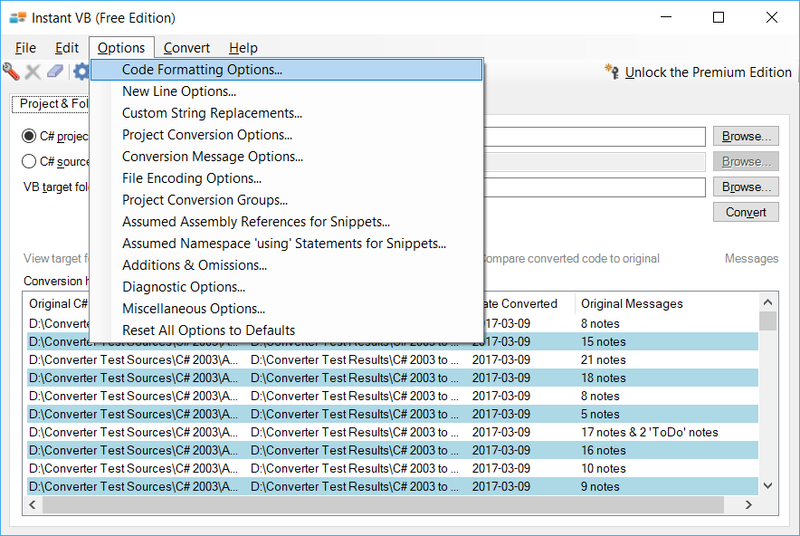 Accurate - 99.98% on Microsoft's "101 C# Code Samples"
Q: Is the original C# project altered in any way? Your existing code is left completely intact. The new VB.NET project is written to the new location that you specify. Q: Do you guarantee a 100% complete conversion? No. Our accuracy is very high, but there will be some minor tweaks required in all but the simplest projects. Read the rest of the FAQ to get an idea of a few things that are not converted. 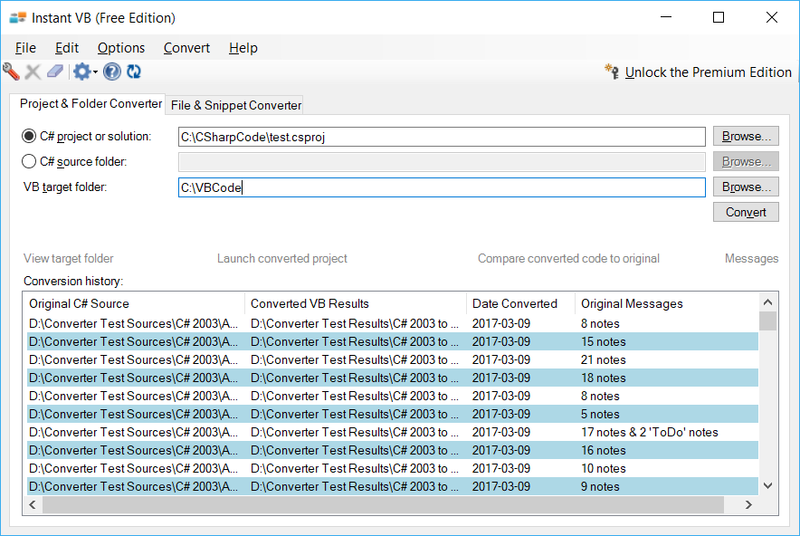 Q: Is C# code within ASP.NET files converted? VB does not allow assignments within expressions, but C# does (e.g., while ((x = y()) > 0) assigns a value to x as part of an expression). Instant VB will convert some cases, but will mark other more complex cases with a "ToDo" comment. You must manually adjust these. Most reference type comparisons are converted, but occasionally you may need to manually change an equals sign to "Is". The VB compiler makes these adjustment requirements obvious. Unfortunately, many new C# features beginning with C# 7 have no equivalent in VB. 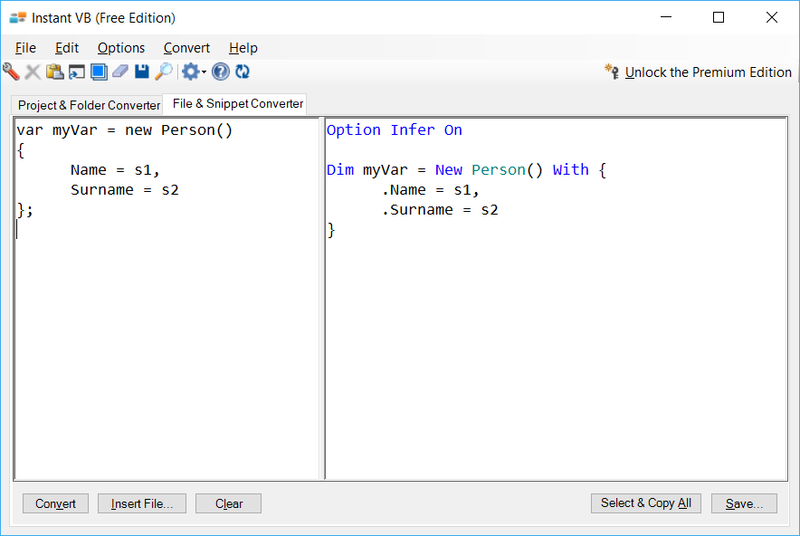 This includes 'throw expressions', 'ref returns', 'ref locals', local functions, 'pattern variables', and 'switch' enhancements such as pattern expressions. Instant VB detects these, comments out some code, and provides 'todo' notes. "unsafe" code blocks and types are not converted. 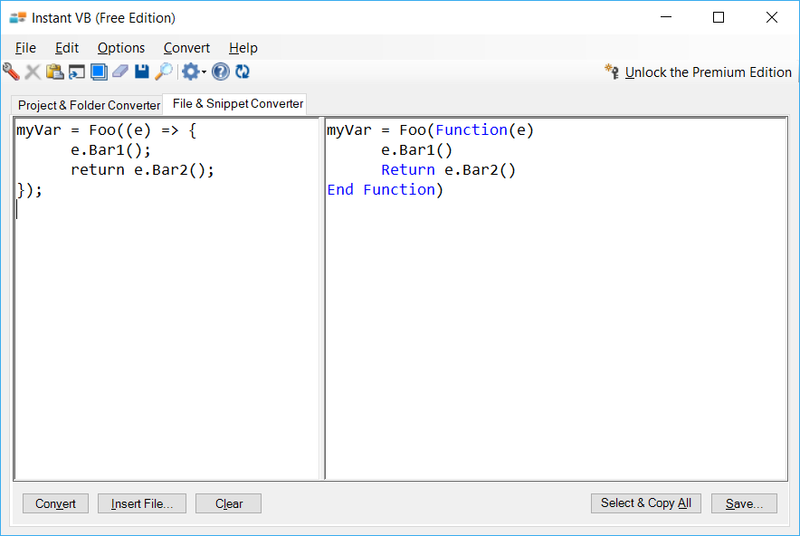 Files with cshtml extensions (using 'Razor' syntax) are not converted. VB does not allow overloading when it is based only on the direction of the parameters (ByVal vs ByRef). Methods overloading done this way will require renaming of the method name in VB.